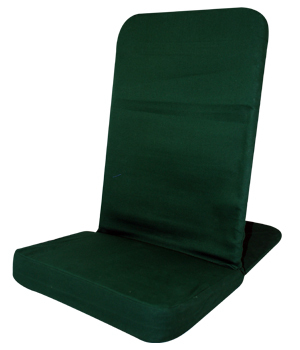 Seat pad measures 14-½" x 10-½"
Meditation chairs are perfect to have in any class that requires meditation. These wonderful Meditation Chairs are made of 100% cotton and can be easily stored in any studio or gym space. Available in a variety of different colors, these chairs are the best way to keep your clients comfortable in a seated meditation. I have attended meditation sessions at someone's home and we sit on the floor. I am always looking for somewhere I can rest my back. I tried this chair in a yoga facility and it is perfect! If it folded it would be perfect. These chairs are designed for meditation and of course are great for that and I have 2 that we use for that purpose (even though I like to sit on the edge with my back straight and not leaning back). But we have more that we use in the living room for us to sit on the floor when we play games with the kids! They work great and are easy to move around. Great.I use it everyday on the floor of my office, I have back issues that prevent me from sitting in a chair for any length of time. I work from home so this chair is perfect. It was EASY to put together and I was very surprised at how it supports my body when I lean back. My only regret is that I had not known about it before.My chiropractor recommended it to me. Customer service was super. Good, comforable chair, I just wish the seat area was a little bigger. I like the product. It is easy to assemble. The color is good. If it's possible, I will suggest to have the cushion seat a little bigger. Also add some more colors. I am happy I bought the chair and may buy a few more for my group. This chair has really enhanced my meditation practice as I can sit comfortably without falling backwards as I did on my meditation cushion. It's so comfortable that I can easily slip into a more peaceful state.